This is the first post of mine, so we’ll see how it goes. I’ve always been intriuged by seeing modern day ruins of things that were. I sometimes spend countless hours researching different pieces of history that fascinate me. So maybe one day they’ll be a post about some weird old structure I come across or a funny story about our pets, but I figured, why not share my weird obsession or some fun stories with the world. 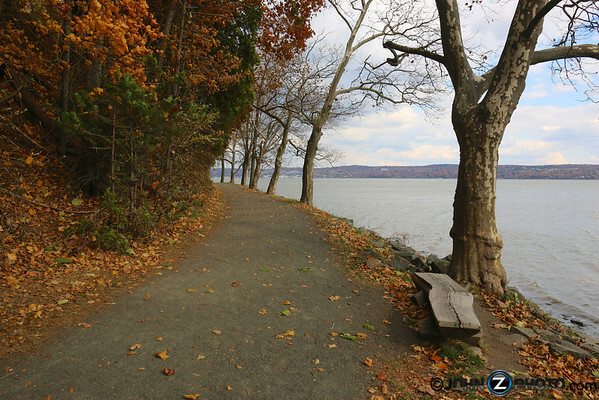 We recently took a few walks at Nyack Beach State park which is a great walking/bike path right on the Hudson River. It’s a great walk with fantastic views of the Hudson River; the kind that makes you want to grab some sandwiches and have a picnic. Before we even started to walk on the path, these tunnels immediately captured my attention. They looked old, but what were they? What were they used for? I assumed they were old train tunnels and just continued on our walk and had a great day with the dog. Once we returned home I couldn’t get the mystery of these tunnels out of my head. Over the next few weeks, I began researching the history of Nyack Beach State park (Hook Mountain) and attempted to find out everything I could. I was amazed to learn that the entire area had once been the site of multiple rock quarries in the 1800’s. Maybe, this was a old remnant of the quarry? One of the things I came across was a picture from the same area in 1926 and sure enough, there were the tunnels again. So at least this confirmed one thing. They were old. 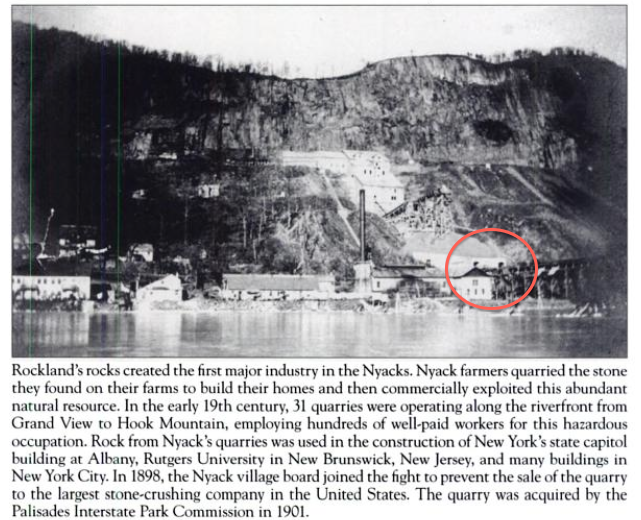 As I sorted though all the different articles, I learned how several wealthy business men, including John D. Rockefeller were instrumental in preserving the nature and view of the hudson river banks that were slowly being blasted away to harvest the stone. I’m also pretty convinced that John D. Rockefeller had other interests in preserving the view, considering his estate lies directly across the river in NY. 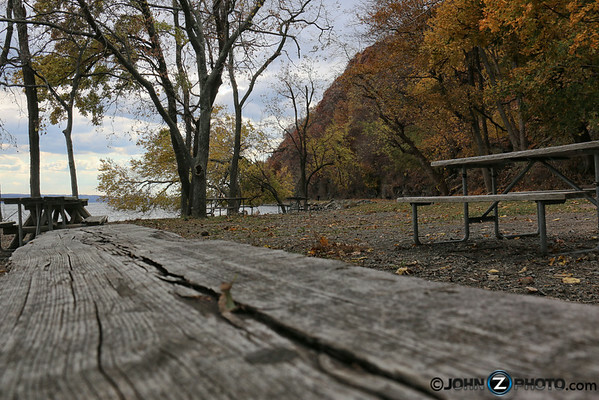 The property was then acquired by the Palisades Interstate Park Commission and deemed for public use only. So looking further, I found a few references to the building directly next to these tunnels. 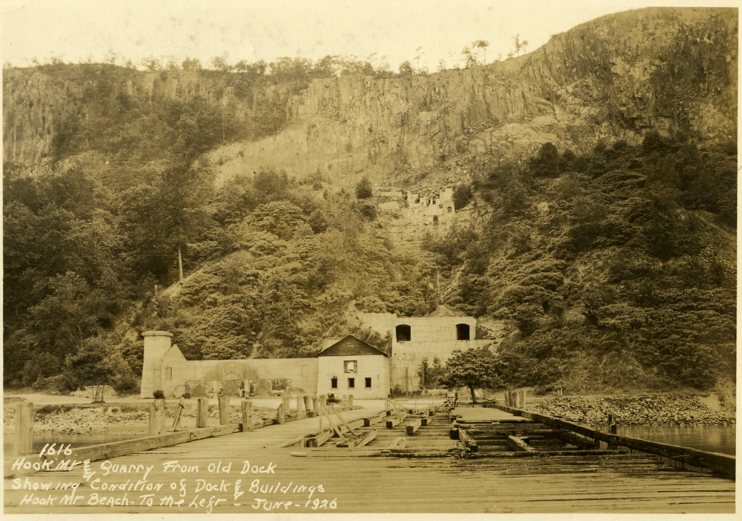 The building was once used as a stone crusher, power house, or quarrying equipment storage, then later restored and used as a bathhouse for swimmers at the Nyack Beach. 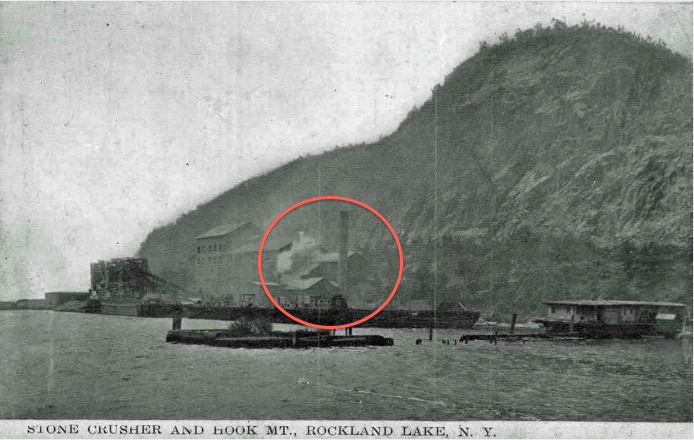 I found this picture from the Historical Society of Rockland County that seems to show the same area. Although, this might be from a site further up the river. So at this point I’m thinking the tunnels were used to deliver stone to the stone crusher before shipping it out from the docks that once existed right below the tunnels. I even found some pictures on flickr from someone who took some photos of old stone structures above the tunnels here, here, here, and here. Here’s an article I found that also shows the same area during the quarrying operations. If you look towards the bottom right side of the photo, you can see the two tunnels. Also, if you look just above them, you can see another building higher up on the mountain. However, then I started wondering if the tunnels went anywhere. Were they sealed off? Were they still open? Where did they go? Well, I wasn’t the only one. I came across an urban explorer who was brave enough to venture into the tunnels. Apparently they go hundreds of feet into the mountain. You can read about his adventure here and here to take a look at what exists inside. So while I can’t say that I’m now 100 percent positive exactly what these were used for, it has now made me facinated with the history of the area. If you’re interested in checking out some of the other photos I took that day, please check them out here. There’s much more to tell and show, but I’ll save that for another day. In a more recent post, I wrote about something else I uncovered in the woods of the Nyack Beach State Park/Rockland Lake area. 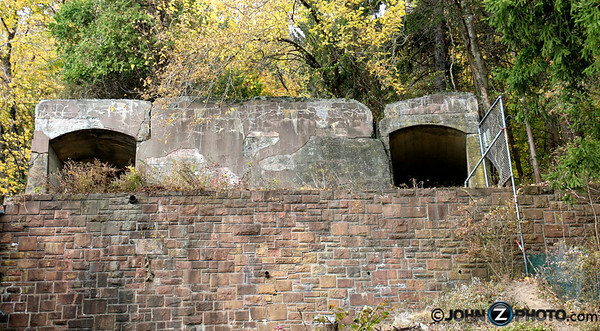 Coming across old rock wall remains drove me to discover an early 1900’s process for harvesting ice from the lake. Check it out here. This entry was posted in Abandoned, History, Nature Walks, Photography, Ruins and tagged Abandoned, Along the Hudson River, American History, History, Hook Mountain, Hudson River, John D. Rockefeller, New York History, Nyack Beach, Nyack Beach State Park, Nyack New York, Palisades, Palisades Interstate Park Commission, Photography, Rock Quarry, Rockland County New York, Rockland County NY History, Tunnel, US History. Bookmark the permalink. My family and I recently went for a walk here in August. I thought the view was spectacular! Thanks for all of the history behind it. It looks just as beautiful in the fall. Keep on blogging! I saw these tunnels over 4th of July weekend and wondered about them and their history and the building next to them. Along the trail heading north there were 2 – 3 abandoned stone houses. Two of them had been plumbed for water. One had a large free standing fireplace in the center. We were wondering if they’d been stone “cabins” built by wealthy land owners or work stations for crews who did what must have been years and years of conservation work along the river to prevent erosion by building rock walls and reinforcements with the abundant stone. Thanks for sharing your obsession! Hey Sarah. I’m glad you enjoyed the post. I’m not sure if you walked all the way up hill to the firehouse and lake, but I also wrote a little about the history of Ice Harvesting on Rockland Lake if you wanted to check it out. Wonderful history lesson. Just came back from a snowy walk up the road to the “Plateau” picnic area above the tunnels and took a foot trail back down to the bike path along the hudson. About half way down the switch back trail we came to a grotto which was obviously quarried. When looking up we observed what looked to be two openings or tunnels with ceilings which were sloped upward with the same angle we were viewing them from below at the edge of the grotto as if some tram once passed through them on a line to reach the bottom two tunnels. Subsequently upon reaching the bike path at the bottom we observed the bottom two tunnels. Thank you for your research in clarifying the mystery.